1. having personal knowledge as a result of study, experience, etc. 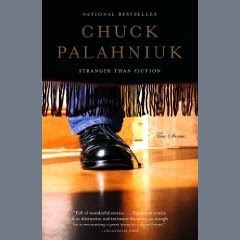 This afternoon I just finished Stranger Than Fiction, a book of nonfiction stories and essays written by Chuck Palahniuk. He would write these nonfiction stories in-between those dark fiction novels that always seem to have some strange twist to them. "If you haven't already noticed, all my books are about a lonely person looking for some way to connect with other people." By reading these works of nonfiction, I feel I've gained a better understanding of Chuck Palahniuk, as if I almost know him personally. I'm a big fan of his work and writing style and take inspiration from it when I set out to write my own short stories. Stranger Than Fiction gives you a glimpse into Palahniuk's mind. Let's you see how he goes about his writing and where he gets his inspiration. His first novel, Fight Club, never sold very well and it didn't become a cult classic until the movie of the same name was released. When it comes to Fight Club, for me this was a case where the movie was actually better than the book. Although I may have been tainted as I never read the book until after I saw the movie. In fact, my first Palahniuk novel was Survivor. But I digress; I'm talking about Stranger Than Fiction. The writing style that I so enjoy, those short, choppy, one-sentence paragraphs, were actually inspired from author Amy Hempel. Her work The Harvest was one of the stories that Palahniuk would discuss in a writer's workshop he attended. I know which book I will be reading soon. Overall Stranger Than Fiction is a great read if you like Palahniuk and are familiar with his novels. If you have never read anything by the guy, and I suggest that you do - all of them, then you probably won't get much out of this book. "There are only two types of people in this world. The ones that ate the paste in grade school, and the ones that didn't"